If you’ve suffered from windshield cracks, chips, scratches, breaks and other damage that affects visibility and safety, we urge you to consider a replacement. Your window glass isn’t a time to cut corners. It provides one of your first levels of protection from road debris. The quality of the installation, materials, and glass have a major impact on the final product. 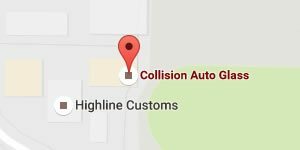 When you’re looking for a windshield replacement in Newberg, get quality services at an affordable price from Collision Auto Glass. We value your safety. You should too. 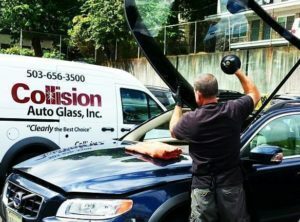 Mobile Windshield Services – Damage can happen at any time. You may need an emergency replacement or circumstances just don’t give you the time to make it to a shop. Other companies charge for mobile services; we provide mobile services for free. That makes it a smart and easy way to get the high-quality windshield you’re looking for even when you have trouble fitting it in. 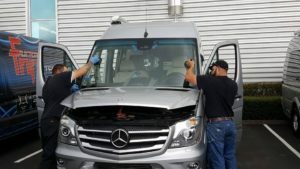 Come To Our Shop – Our permanent location in Portland is equipped to deliver fast and accurate windshield replacements. In addition to housing our auto glass, its layout and access to high-end electrical tools mean we can finish faster. This often results in same day service, so you can get going. No matter where we perform a replacement you can guarantee it will be done by a technician that is SIKA & DOW certified. OEM quality replacement parts: All of the parts we use are designed to meet or exceed original manufacturer safety measures and tolerances. That keeps you protected. OEM quality adhesives: We use industry standard SIKA urethane. It delivers the best performance for a secure and leak-proof windshield you can depend on. Free mobile services: Our mobile services don’t cost you anything extra. Why pay more with another company when you can get better service right here? Free glass disposal: Companies are always looking for add-on fees. Glass disposal is a primary culprit. Not here. We recycle your broken or damaged glass free of charge. Same day service: Certified technicians allow us to frequently provide same-day service while maintaining our high installation standards. We replace windshields on all automobile makes and models! Newer vehicles may be equipped with advanced safety features. These can extend to the windshield as well. That means certain vehicle models require extra care and attention. Moldings and clips may also need to be replaced on higher-end and luxury brand vehicles like Lexus, BMW, and Lincoln. Our technicians know what needs to be performed on every vehicle. 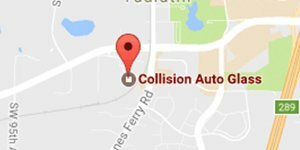 That means cars, trucks, and SUV’s at every level. Get a safe, secure, and correctly performed windshield replacement today. Our windshield and rock chip repair services are available 24/7, so call any time. Whether you need emergency windshield service or would like to schedule an appointment, we’re available to help. Don’t wait, call or contact us now.